Thanks to all for another great fair! It was another great year at the Lyndhurst Turkey Fair! What a great way to close out summer – with perfect temperatures and a nice cleansing rain to finish the day. Thanks to all who came out knowing the forecast was less than perfect – you were rewarded with almost an entire day of decent fair weather. We want to thank all the volunteers, without whom this day would not be possible. There is a really amazing crew behind the scenes all year and an even bigger team that comes together the days before and right after, who put up and take down everything you see. Huge thanks to all the sponsors that enable us to provide fairgoers with fun activities and events; to all the demonstrators and performers who donate their time and talents; to our local dignitaries for coming out to open the fair; and to everyone that came out this year, and those who come back year after year, because it’s you, our patrons that make the fair what it is – the best country fair around! It’s finally here! 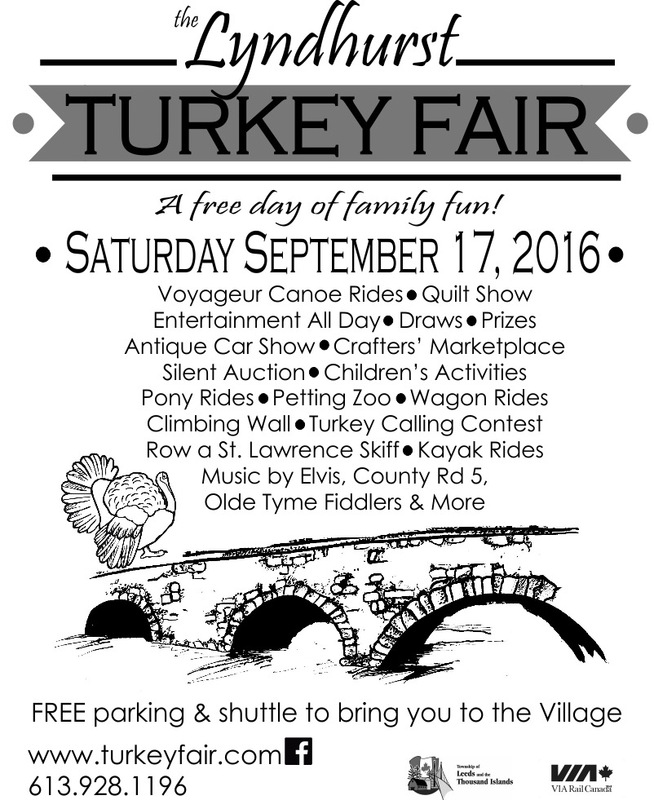 The Lyndhurst Turkey Fair is tomorrow and it’s going to be an awesome time, as always. Here’s a great article published in the Ottawa Citizen to inspire you to come out to our beautiful village for the day. Click here to check it out! Hope to see you there! If you love the fair and would like to help tell others about it, this cool poster can be printed out and shared with friends, family and strangers! Pin them up to spread the word! Music line up set for this year’s fair! Check out our Entertainment page for the full line ups for our 3 stages. Don’t miss these great shows! It was another GREAT day at the Turkey Fair! Thank you to all the volunteers, without whom this day would not be possible; to all the sponsors that enable us to provide fairgoers with fun activities and events; to all the demonstrators and performers who donate their time and talents; to our local dignitaries for coming out to open the fair; and to everyone that came out this year, and those who come back year after year, because it’s you, our patrons that make the fair what it is – the best country fair around! Visit our ‘Thanks’ page to see our list of contributors. Our amazing hunting dog demonstration is back this year! 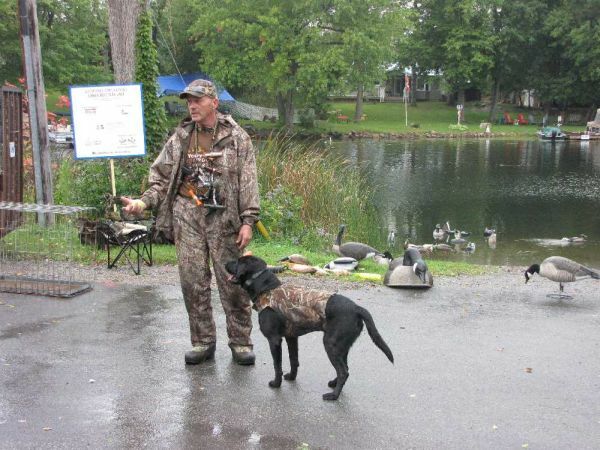 Glen Snider will be back this year with his hunting dog demonstration at the boat launch in Furnace Falls park. Check out this display of obedience and retrieving skills at the Turkey Fair! Thanks to the Township of Leeds and 1000 Islands! The Turkey Fair committee would like to send a big thank you to the Township for awarding a grant that the fair will use to purchase new, much-needed tables for use during the fair. With our current storage issues, these tables will be easy to keep, along with being safe and long-lasting. Thanks to the township, the council and the grants committee! Hope to see you all at the fair!